Google Plus Collections - Good Place for Research??? 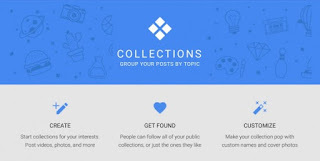 I have been having a play with Google Plus Collections. I have been making a test collection called "Interesting Design" just to see what it was all about and if it would be of any use to me and my design students. After playing for a while now, I like it as a place to collect related items, but I decided to make a decision on wether or not to use it next year based on what my Y11 students think. 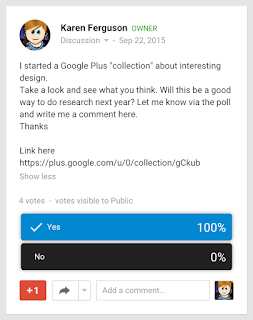 I posted a poll in our class community to get a feel for what they thought after looking at my example collection. Today, we also had a chat about it. They liked that it is so multi media - you can post links to sites, videos, images etc all about a related theme and they liked that others can see your research and you can see theirs. What would improve Collections would be if we could have a collaborative collection where the class could input into the same place. Maybe this will come in the future. So... roll on next year and we can give it a go in reality during a project. Too late for seniors this year.. only 4 weeks to go!! 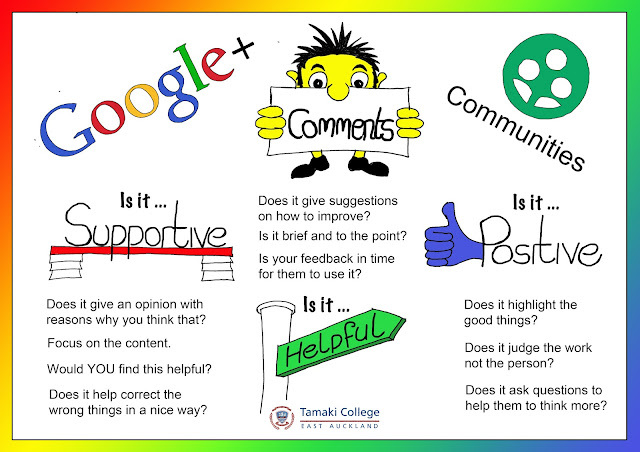 As a school, we have moved towards using Google Plus Communities as a method for students to share their work and to give feedback to each other. This doubles the impact of the work for the students as they are having to think about the work again to give quality feedback. In an effort to support them to give quality feedback, I was asked to come up with a graphic that could highlight the main points. I have been thinking about questioning techniques with my students for a while now as a way to effectively analyse the design work of others and their own. I had thought about question types with the different SOLO levels on this blog post here. I then started putting together some example questions for my new Year 10 group to use to analyse the design of mobile phones. A great, helpful resource here was the iPad app made by Hook Education - Question Generator. This helped me to categorise my thoughts about this activity into where they should be within the SOLO structure. Here is the presentation I made for the students to use to break down their questions. 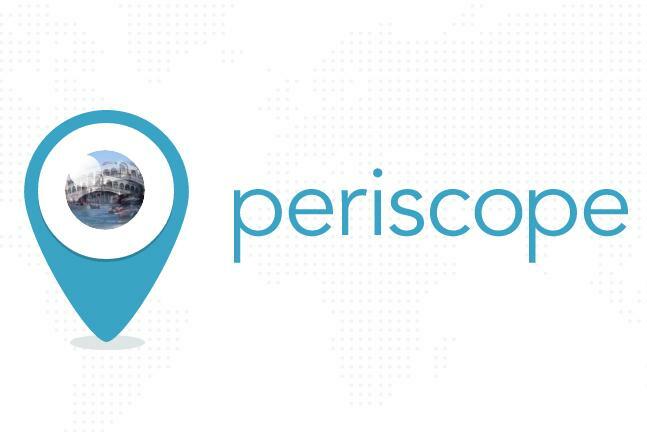 I have been hearing a lot on line about the Periscope app and decided to give it a go myself. I installed it last weekend and had a go at live streaming during my walks round town on Saturday. I quickly became fascinated by all the live streams coming in from all around the world. Powerful stuff!! Today, I met my new Year 9 class on their Technology rotation. It is good how it gives you the option to save it onto your phone, but it still keeps it online for you to link to as well. It puts up a notification in Twitter if you want it to to advertise your stream. The next step will be to get the students to live broadcast themselves.... good stuff. I have had my eye on an iPad app for a while. It is called Astropad. Link Here. This app mirrors what you see on the computer screen so you can draw into programmes like Photoshop and Illustrator that you have installed on your computer in a much more natural way. Students find it tricky to use the wacom graphics tablets as they have to look at the screen while drawing on the tablet. This takes a lot of getting used to as you are not looking at your "pen" tip as you draw, and this does not feel natural at all. Another negative of the graphics tablets is that we have a couple of missing pens, which renders the tablets useless. 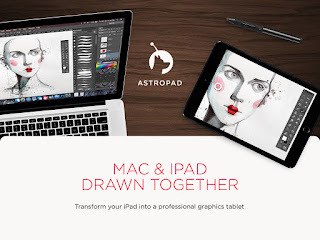 The Astropad app means they can look at the iPad while they draw and their work displays on the computer screen at the same time. I put this on my iPad the other day and had a little go with it. I let a couple of my Year 12 DVC students have a go on it today to get their feedback and thoughts. They really enjoyed using it and found it very easy to draw with both in Adobe Photoshop and Adobe Illustrator on my laptop. I think this will definitely be on my budget request for next year to install on the 5 iPads we have in DVC.